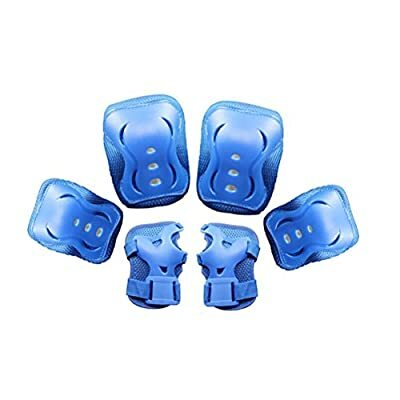 The product is a set of expert and practical kid kids roller skating cycling protective pads, which consists of one set of knee pads, one set of elbow pads and one set of wrist pads.- Knee pad size (L * W): about 5 1/4 * 4 inch( 13.3 * 10cm); Elbow pad size (L * W): about 4 1/2 * 3 3/4 inch (11.4 * 9.5 cm); Wrist pad size (L * W): about 5 * 3 1/4 inch (12.7 * 8.3 cm). 1 * Pair of Kids Knee Pads( Pink) 1 * Pair of Kids Elbow Pads( Pink) 1 * Pair of Kids Wrist Pads( Pink ). Color: mainly pink. Material: soft EVA and hard plastic. Suitable for children and kids aged 5 to 16 years old. Knee pad size (L*W): about 5 14*4 inch (13.3*10cm); Elbow pad size (L*W): about 4 12*3 34 inch (11.4*9.5cm); Wrist pad size (L*W): about 5 *3 14 inch (12.7*8.3cm). Includes one pair of knee pads, one pair of elbow pads, and one pair of wrist pads. Knee and elbow pads are kept in place with two elastic velcro straps. Wrist pads are held in place with two velcro straps. Adjustable size for comfortable to wear.